Today we are going to talk briefly bit about the FAQ update as well as the Tournament Rule changes just released by Fantasy Flight on the 24th. Overall, there isn't much in the FAQ that changes in a dramatic way an understanding of any of the cards. For the most part, it is a clarification of the existing rules. 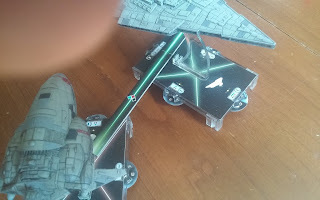 Interestingly enough, the ruling of XI-7 Turbolasers and how they interact with the Advanced Projectors was not covered (it should be noted that Advanced Projectors lets you transfer 1 damage to each hull zone against an XI-7 attack, per FFG email). The biggest change was how attacks were made, specifically how line of sight was established on hull zones. Previously, the rule as worded allowed you to take shots on an enemy hull zone if it was in arc and had line of sight that did not go through another hull zone. Now you have to measure both line of sight AND attack range to ensure neither one goes through another hull zone. AFII has a line of sight on the VSD's rear arc. But the VSD's rear arc isn't in the AFII's side arc per the new rules. Above, the pictures show a shot that with the previous rules as written would be perfectly legal. The rear arc of the VSD is within the side arc of the AFII (though you'd have to go through the VSD's side arc to measure it), and there is Line of Sight between both arcs. Under the new rules, because the shortest point between the two that is still in arc is now covered by the VSD's side arc, the shot is no good - the AFII cannot shoot the VSD's rear with its side arc. The nearest point in arc is not. 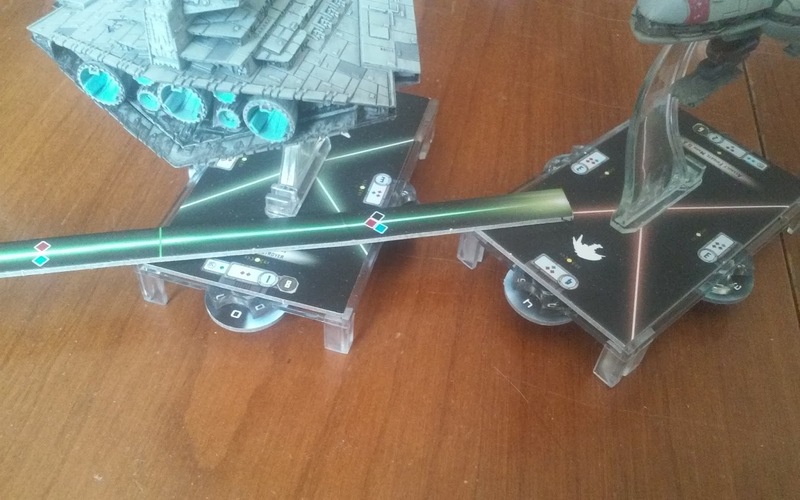 This is the example of something that is still legal - in the above scenario, the AFII has the rear hull zone of the VSD in its front arc, and still does according to the new rules after measuring for range. It also has the line of sight, making it a perfectly legal shot. Each attack against a squadron is treated as a separate attack for purposes of cards. 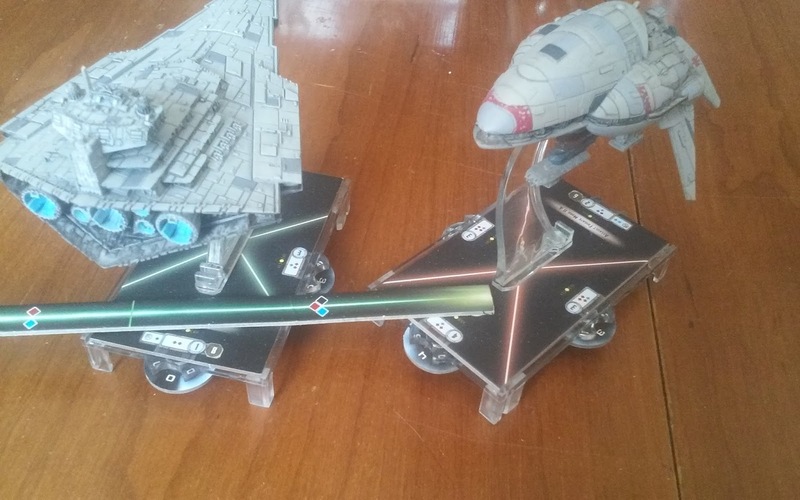 No, you are not allowed to attack ALL squadrons with two extra blue dice with Dominator, unless you spend shields for each attack. 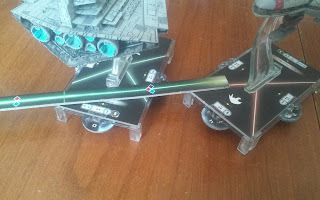 Admiral Motti - Sympathetic Death for your ships is now a thing that can happen: if Motti's ship is destroyed, and another of your ships has enough damage to destroy it without Motti's effect, it blows up too. Admiral Screed - Yes, he works like you think he does. Screed lets you change a dice to any face that has a crit, even if other things are on that face. Demolisher - You can use the post-maneuver attack after you use Engine Techs. You cannot maneuver > attack > engine tech maneuver > attack. If you don't attack before you maneuver, the first attack is lost. Demolisher only affects one of the attacks. Warlord - Like Screed, you can use Warlord to change your red dice to a double hit result. Garm Bel Iblis - Just a friendly reminder, no duplicate command tokens. 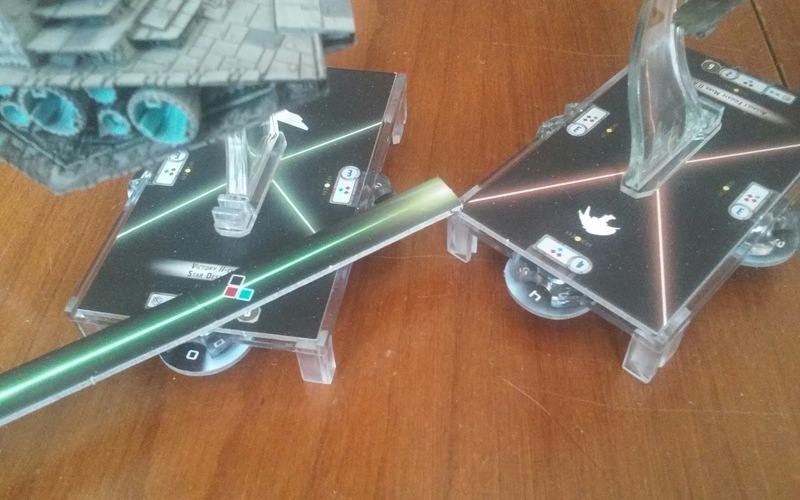 First there is a quick clarification on what happens if both players have all their ships blown up at the same time - even if there is a point differential (from objectives), the Second Player gets a win, and the game ends with a 0 point margin of victory. Ackbar played Vader, Piett, and Ozzle. 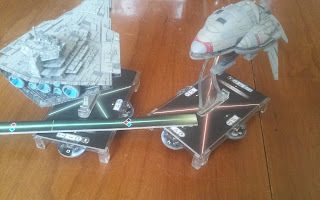 Vader has 26 Tournment Points, Piett has 10, and Ozzle has 15. Ackbar - according to the basic tournament rules, would have a total Strength of Schedule of 51. Conversely, Ozzle had a first round bye. 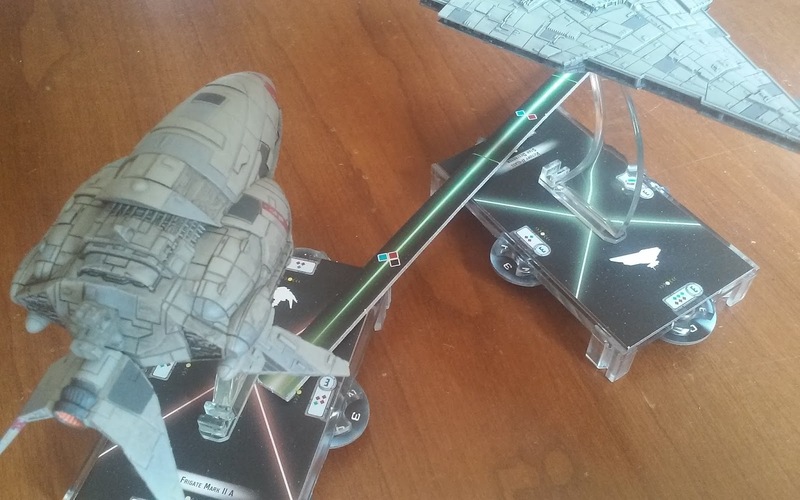 His opponents were Solo and Ackbar. Solo had 21 ponits, and Ackbar had 24. For the old way of measuring, he wound up with 44 points for Strength of Schedule. So you can see that the new TOME calculations remove byes from the equation, as earlier Ackbar would have a much better Strength of Schedule even though most of his opponents had byes, and Ozzle had a much worse Strength of Schedule because of his early bye. But with the TOME calculations, the effects of the byes are removed, and you get results based on only the games that were played. Something to keep in mind if you are playing in a tournament. The next is how pairings take place. Pairings are random for the first round, but Players can ask not to be paired up with people they traveled with or family members for the first round only. After the first round, players are paired up against one another randomly, based on their Tournament Score. If an odd number of players are in any particular Tournament Score, a random player from that group is they are paired with a player from the next lowest group. The other big edit is that players should not be paired against each other more than once before the end of the tournament / elimination rounds. Painting your ships is now a legal way to differentiate who owns which ships. You can only use one measuring tool at a time to measure range / distance / movement. No triangulation! And no marking things off with tokens. 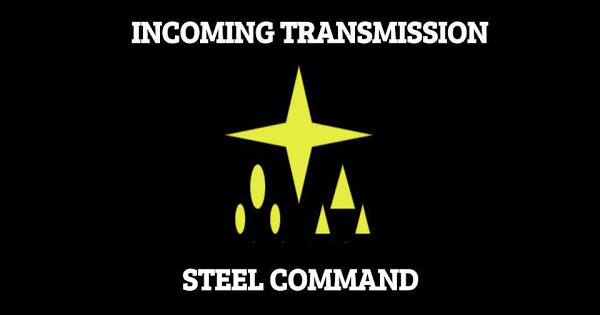 Both players need to agree on how to mark displaced ships when moving through areas. Well, that's it for this update. I hope this lets you look at the big highlights of the changes for the tournaments and FAQs. Next time I'll discuss movement and formations! Want to know right when my next article comes out? Don't forget to follow this blog!